The white Casio PX-S1000 Digital Piano Standard Home Bundle Kit from B&H includes a black PX-S1000 Privia 88-key digital piano, a CS-68 furniture style keyboard stand, an Auray PBM-FS metal frame piano bench with storage, an SP-34 triple pedal, a keyboard dustcover, an AC adapter, a music stand, a sustain pedal, and Polsen HPC-A30 closed-back, studio monitor headphones. This kit is designed to fit in any room, with any decor, and offers string resonance, damper resonance, and key-action noise to offer sounds of grand piano, electric pianos, organs, strings, and more, with seamless transitions and excellent dynamic range. 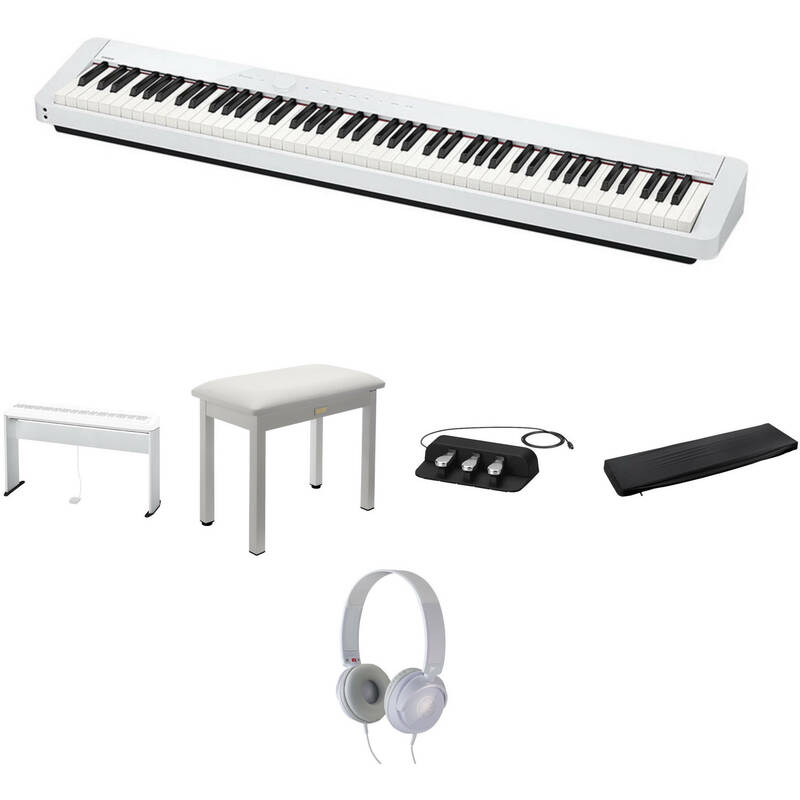 The white PX-S1000WE Privia 88-Key Digital Piano from Casio features a scaled, hammer-action keyboard that provides built-in speakers, eighteen built-in tones with layer, split, and duet modes and is designed to fit in any room, with any decor, and with any mood. Five Sensitivity levels, 192-note maximum polyphony, and an acoustic simulator, result in string resonance, damper resonance, and key-action noise to offer a grand piano sound with seamless transitions and excellent dynamic range. The PX-S1000's design fits any room, any decor, and any mood. The white finish with its sleek glossy panel and unibody case evokes an acoustic grand in a case that's barely larger than the keys themselves. The white PBM-FW Metal Frame Piano Bench from Auray features a classic design that will support up to 300 lbs. It is built with a 2.5" padded leatherette seat that provides many hours of seated comfort and is durable for stage, studio, or home applications. Two height-adjustable feet offer extra stability to stablize the bench on uneven floors. A wrench is included for easy assembly. Thanks to the sturdy metal construction, the PBM-FW piano bench can support up to 300 lbs. The white HPH-50WH Compact Stereo Headphones from Yamaha are entry-level headphones that deliver professional-grade sound with a carefully-balanced bass and treble while playing back recorded media or performing on a digital instrument. These headphones feature a swivel mechanism that allows the driver unit to turn up to 90° to fit the angle of your ears comfortably, and a length-adjustable headband. The 6.6' cable terminates in an 1/8" stereo plug; a 1/4" adapter is included to allow you to plug these headphones into various instruments. Box Dimensions (LxWxH) 24.5 x 11.0 x 10.0"
Box Dimensions (LxWxH) 9.213 x 6.535 x 2.047"